Here, we report and investigate the genomic alterations of two novel cases of Non-Hodgkin Lymphoma (NHL) in children with Williams-Beuren syndrome (WBS), a multisystem disorder caused by 7q11.23 hemizygous deletion. Additionally, we report the case of a child with NHL and a somatic 7q11.23 deletion. Although the WBS critical region has not yet been identified as a susceptibility locus in NHL, it harbors a number of genes involved in DNA repair. The high proportion of pediatric NHL reported in WBS is intriguing. Therefore, the role of haploinsufficiency of genes located at 7q11.23 in lymphomagenesis deserves to be investigated. Chromosomal disorders are common circumstances for the discovery of a genetic predisposition to cancer allowing identification and localization of new oncogenes. Williams-Beuren syndrome (WBS) is a multisystem disorder caused by 7q11.23 hemizygous microdeletion . WBS is not currently considered as a risk factor for cancer. However, the low incidence of both WBS and pediatric NHL (Non-Hodgkin Lymphoma) might hamper our ability to identify any association between these rare diseases. An increased risk of NHL in WBS might have easily been underestimated until today. Furthermore, the number of pediatric cancer reported in WBS has reached 11 cases and, strikingly, 8 (73%) of them where NHL, mostly Burkitt lymphoma (Table 1). Here, we report 2 novel cases of NHL in children with WBS and the additional case of a non-WBS child with NHL and somatic 7q11.23 deletion (see case description in Additional file 1). TS: This Study; NHL: Non-Hodgkin Lymphoma; ALL: Acute Lymphoblastic Leukemia, F: female; M: male. Since several different deletions account for the genotype of WBS, we first investigated germline and somatic structural variants in these latest 3 patients using array-based CGH (Figure 1). 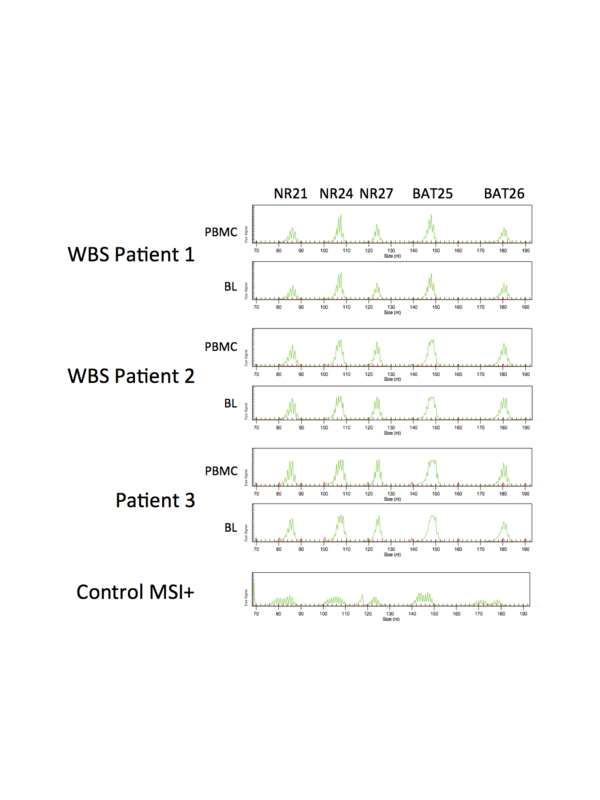 We confirmed the presence of a constitutional 7q11.23 deletion in WBS patients. No germline Copy Number Variation (CNV) was observed in patient 3. Intriguingly, the somatically acquired 7q11.23 deletion that occurred in lymphoma of patient 3 was similar to the classical germline deletion observed in WBS patients and there was no evidence of other rearrangements occurred in this tumor. Lymphoma cells of WBS patients exhibited CNV commonly found in B cell lymphoma excepting a subclonal deletion of approximately 10 Mb at the locus 2q33.1-q35 involving IKZF2 in WBS patient 2. A recent study by Holmfeldt et al. demonstrated that this deletion was common in low-hypodiploid acute lymphoblastic leukemia  but this deletion had never been described in NHL. Then, next generation sequencing of the WBS region showed a germline homozygous variant in exon 25 of ELN (c.1741G > C, p.Gly581Arg, rs.17855988) in the 2 WBS patients. ELN encodes elastin, a constituent of elastic fibers. Many variants of ELN has been described and were associated to the severity of cardiovascular symptoms of WBS patients. No recurrent variant was observed in the 27 other genes nor in the 2 miRNA loci of the WBS critical region. Array-based comparative genomic hybridization analysis of normal tissues and lymphoma cells of 2 WBS patients and of a third child without WBS but with NHL and a somatic 7q11.23 deletion. A. Typical hemizygous loss of the WBS region on chromosome 7q11.23 spanning 1.5 Mb was observed in normal and tumor DNA of 2 patients with WBS. Patient 3 had the same deletion in lymphoma cells but this deletion was somatic. B. Study of somatic chromosomal rearrangements showed a homozygous deletion encompassing chromosome band 9p21.3 at the INK4a/ARF locus on the tumor of patient 1. 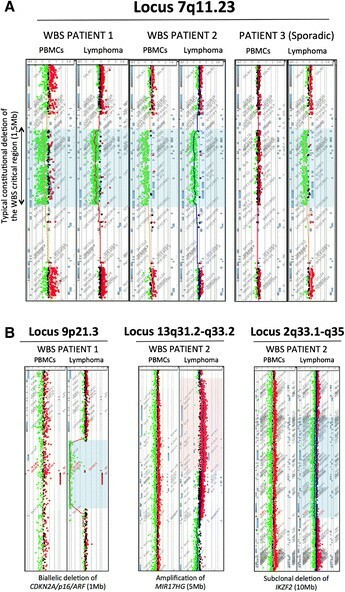 WBS patient 2 exhibited a large subclonal deletion on chromosomal region 2q33.2-q34 encompassing the IKZF2 gene locus and an amplification of a 10 Mb region at the locus 13q31.2-q31.3 involving MIR17HG. Patient 3 had no other chromosomal rearrangements in the tumor. PBMC: Peripheral Blood Mononuclear Cells. A number of genes mapping to the WBS region are involved in DNA repair: 1) Eleven PMS2 pseudogenes loci are located at 7q11.23. PMS2 plays a crucial role in the DNA Mismatch Repair and a childhood cancer syndrome is associated to biallelic mutations of PMS2. However, in our study the 3 patients showed stable microsatellites (Additional file 2); 2) BAZ1B encodes a transcription factor with an intrinsic tyrosine kinase domain that phosphorylates Tyr142 of histone H2A.X and is involved in the maintaining of gH2A.X in the sites of DNA damages ; 3) RFC2 encodes a subunit of the Replication Factor C complex that interacts with BRCA1 for post replication repair after UV-induced DNA damage ; 4) GTF2I encodes a transcription factor that promotes DNA translesion synthesis and genomic stability interacting with PCNA and DNA polymerases . Finally, the hypothesis of a constitutional genomic instability in WBS is consistent with the results of a study by Savina et al. that showed experimentally the relationship between an abnormal DNA-damage response and the 7q11.23 hemizygous microdeletion when comparing the comet assay data in FISH-positive and FISH-negative lymphocytes from WBS-suspected patients . 7q11.23 deletion has been found as a relatively common occurrence in pilocytic astrocytoma , of which variants have been reported in 2 patients with WBS ,. Nevertheless, genome-wide copy number analysis in NHL, including a recent study by Conde et al. that analyzed 648 patients, ages 20 to 85 years, have not found a susceptibility locus at 7q11.23 . However, NHL in adults encompasses a heterogeneous spectrum of diseases in which diffuse large B-cell lymphoma predominates. NHL in children is a more rare event and pediatric DLBCL is uncommon. Burkitt lymphoma that predominates in pediatric NHL, has also been studied by genome-wide CNV studies. Notably, Scholtysik et al. demonstrated a recurrent loss at 7q11.22, localized at the centromeric limit of the WBS critical region, in 39 cases of BL . Amplifications of the WBS critical region have also been found in a variety of cancers including large B-cell lymphoma , ovarian adenocarcinoma , papillary thyroid carcinoma  and cholangiocarcinoma . This might reflect complex mechanisms that regulate initiation/promotion of cancer cells by oncogenes and tumor suppressor genes clustered around recombination hot spots or fragile sites in the WBS region. Althought no epidemiological studies demonstrated an increased risk of cancer in WBS the high proportion of pediatric NHL reported in WBS and the occurrence of a somatic deletion of 7q11.23 in NHL is intriguing. In these patients, NHL seems to arise in the presence of the typical WBS microdeletion and in the absence of homozygous mutation. The role of haploinsufficiency of genes located at 7q11.23 in lymphomagenesis deserves to be investigated. This work was funded by the French association “Cent pour sang la vie”. We would like to acknowledge the study participants and their parents. We thank Brigitte Gilbert-Dussardier for her help in contacting the different investigators. We also thank “Comitato Maria Letizia Verga (Monza) per lo studio e la cura della leucemia infantile” for the continuous support to research activities of Carmelo Rizzari and Tiziana Coliva and “The Swedish Childhood Cancer Foundation” for financial support to research works of Catarina Lundin. Finally, we thank Annalisa Weygandt for the English language editing of the manuscript. DG, JS, PSR and CB designed the study. SQ and JS performed CGH-array and analyzed the results. DG, and CF analyzed the next-generation sequencing data. LB performed Microsatellite instability assay. CR, TC, PSR, CL, HF and PE provided clinical and diagnostic input. DG, PSR, CL, CB and CR wrote the manuscript. All authors read, reviewed and approved the manuscript.